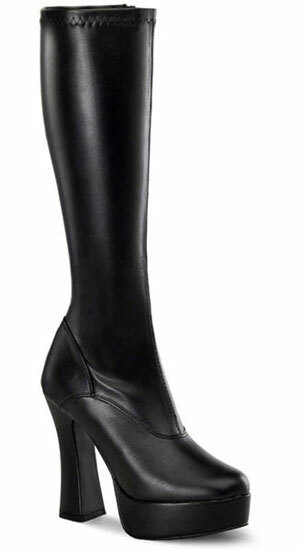 Black stretch 5 inch heel knee high platform boots with inner zipper. I absolutely LOVE this boot! Beautiful arch, nice high heel...perfect! Customer service is Awesome! I am a new customer and I encourage all to place your order from this company. From the speedy customer service replies, to the speedy shipping (UPS), to receiving the awesome product itself. I am planning on ordering more platforms and a few chokers!